I just stayed up past 2am for two nights in a row, and it turns out I can't really do that any more. Both nights, I was ready to go to sleep around 6:30pm but managed to hang in there until 2:00 (and drove home both times in my official capacity of DD, although Ryan can take that back over now since he's given up alcohol for 2011). But when I woke up this morning, I seriously felt like I was hungover. Maybe because I had been drinking oj/sprite instead of water, but I felt like I got run over by a truck. Also, as a new development in my issues with sleeping, I've been having some really weird dreams for months now, but I woke myself and Ryan up this week from laughing. I was laughing in my dream and apparently in real life too, and I was very creeped out by this. Ryan thought I was crying, but no. I was just doing some creepy laughing at 5 o'clock in the morning. In less disturbing news, I may have felt the baby move for the first time! I think it's supposed to be way too early to be able to feel anything yet, but I felt some fluttering on my left side earlier this week that I haven't felt before or since then, so maybe. The RLP is getting to be a bit more pronounced too. I'm trying to move my body at the same time so I'm not twisting at my mid-section, but it's been hurting when I get out of bed and whenever I sneeze (which is still all the time). This is yet another symptom that I don't mind, though, since if it means things are stretching out for a growing baby in there, then I'm happy. Also, my OB gave us some travel guidelines at my appointment this week. She recommended we travel between 18 and 28 weeks (so end of January through the beginning of April), so we're trying to decide if we're going to try to fit one more trip in while we still can. We've been thinking about going to Dublin and doing a working vacation (since Ryan's work has an office there and I'm pretty sure I can get approval to bring my laptop to do work outside the U.S.) to avoid using up PTO we'll need later on in the year, so if we do that, we've got a very limited window since my prenatal yoga and our weekly childbirth classes will be starting up pretty soon, and I'd rather not miss any of those (especially the childbirth classes). The other major problem is how in the world I'd actually make it anywhere on a plane, since I'm really trying not to take any medications unless absolutely necessary. I haven't flown without being on my beloved Bonine for over a decade now, and I'm a little scared to try flying without it now, especially on a long trip. So there's that, which could make for a very unpleasant trip full of motion sickness if something goes wrong. 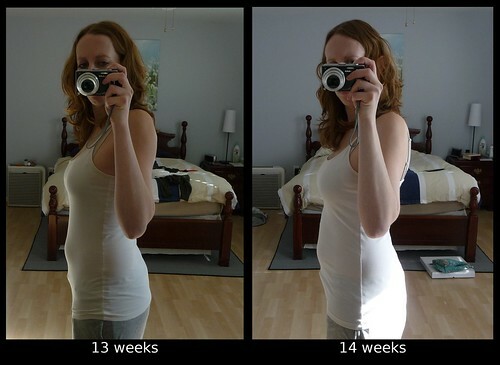 I think I can actually tell a difference in the comparison pic from last week - it looks like my belly is filling out a little bit around what had been my bloat belly bump.